Today is Kerry-Anne's birthday and at this stage she's received so many messages from people on Facebook, Twitter, on her cell phone, and in her mailbox that she's spent the whole day just getting through them all. I never knew that she knew so many people! So, believe me, if she hasn't yet responded to your message, it's not because she's ignoring you. Posted in Activities and tagged leisure, sea, sport on Tuesday, 7 July, 2009 by Paul. What a fantastic view! Gosh, where were you? And if you say you’re parasailing/gliding/chuting, I’m going to turn green with envy! 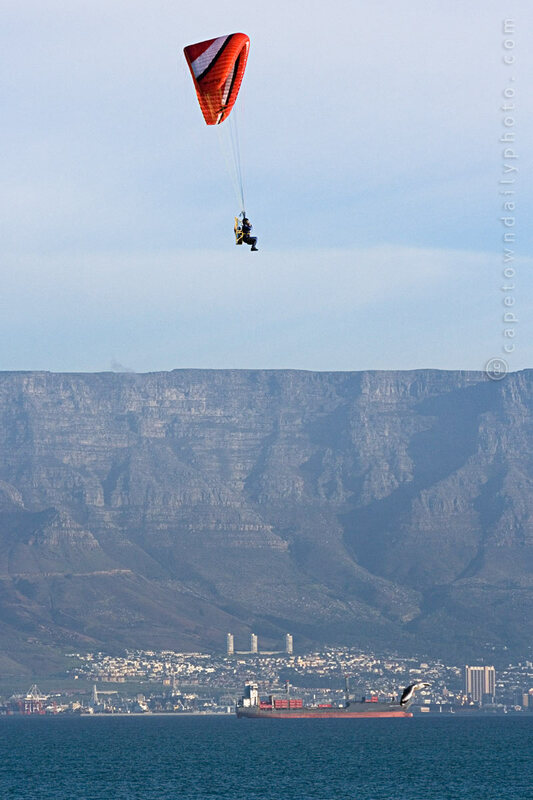 Imagine the view the guy attached to the parasail must have had! Nope, not parasailing, gliding, or chuting… but you may still turn green… standby for clue #2 in the next post. WOW – that is an awesome photo! You take my breath away.